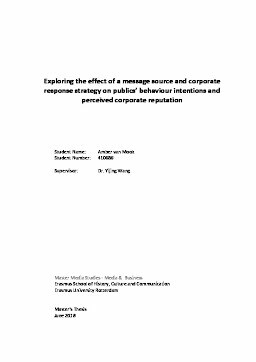 This study aimed to explore whether a message source (CEO or employee) and corporate response strategy (deny, diminish, apology) had an effect on public’s behaviour intentions and perceived corporate reputation after a corporate paracrisis. The reason for focusing specifically on the paracrisis is its relevance for contemporary crisis management that springs from the increasingly powerful role of social media and evoking an issue to a crisis. In this study it was discussed whether Attribution theory, Image repair theory or SCCT would be the best theory to follow in order to solve a paracrisis. SCCT was seen to be the most applicable theory. As little to no research was done on the topic, the results would provide good insight in whether selected SCCT response strategies apply to the paracrisis. Moreover, existing literature do not agree on who should be perceived as the most credible message source in times of a crisis; the CEO or the employee. To find out whether SCCT is applicable to the paracrisis, and who is perceived as the most credible message source, the following research question was posed: “How do a message source and response strategy affect post-crisis reputation and the publics’ behaviour intention among the public of a preventable crisis?” Based on this research question, four hypotheses were established. In order to answer the research question, an online experiment was conducted in ‘Qualtrics’ using a 2 x 3 factorial between-subject design for a total of six conditions. Each condition included a combination of one message source and one response strategy. The data for this study were collected via online tool MTurk whilst adopting a simple random sampling method. A total of 438 people participated in the experiment. However, after filtering out 144 participants, the final sample was compiled of 294 participants. Participants were randomly assigned to one out of six different conditions. Each condition presented several stimuli; a biography of George Allington who was described as either the CEO or employee of PlasTech Innovations, a corporate description, and a fictitious news article in which allegations were made towards PlasTech Innovations. Lastly, participants viewed a corporate crisis response conform to the condition. After all responses were collected, several statistical tests were conducted in SPSS to test the relationship between the fixed factors and the test variables. The findings showed insignificant relationships between the fixed factors response strategy and message source, and the independent variables ‘Post-crisis reputation’ and ‘Behaviour intentions’ . Consequently, all four hypotheses were rejected. All in all, this indicates that both the message source as well as the response strategy do not significantly influence the post-crisis reputation perceptions and behaviour intentions in the sample. The rules of SCCT are seen to be inapplicable to the distinctive paracrisis. Therefore, in order to be able to respond to a paracrisis properly, a new theory should be established which takes into account the characteristics of the paracrisis.